This fashionable, value-oriented 2-Ply bathroom tissue with elegant emboss is certain to please your most discriminating patrons. Features a coordinated wrapper and facial box to create an attractive ensemble. 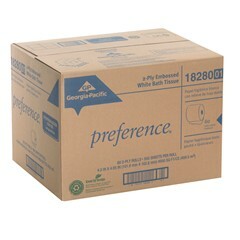 Perfect Size™ 80 roll case and full size 550 sheet roll make this a popular choice.